Have you heard the good news?! Halifax is getting it's own chapter of the Canadian Association of Girls in Science (CAGIS)! Starting in September, 2019. CAGIS is an award-winning club for girls aged 11 to 16 that facilitates interest in Science, Technology, Engineering, and Mathematics (STEM). CAGIS chapter members meet monthly to explore STEM with fun, hands-on activities led by women and men experts in a variety of STEM fields. These monthly events often occur at the work places of our STEM experts, giving girls a behind-the-scenes view and allowing them to experience the lab and field environment for themselves! 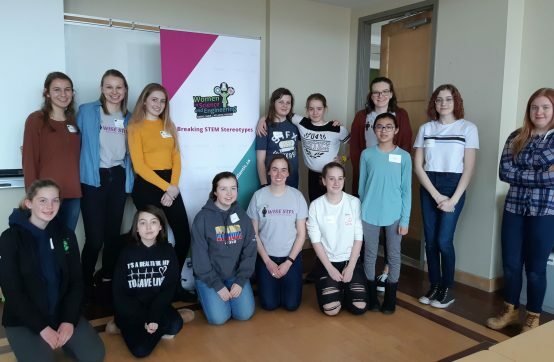 We had a fantastic time at the first-ever Girls Get WISE Science Retreat at St. FX University on March 23, 2019. The 11 girls who participated in the event learned the physics behind roller coasters and used that knowledge to build their own roller coasters using foam pipe insulation and marbles. X-Chem Outreach coordinator Jennifer Fraser led the other hands-on session; using various methods to test the pH of various household chemicals. Thanks to our role models, Kelsey Sampson – Primary Care Paramedic, Dr. Genice Hallett-Tapley – Chemist, Brittany MacDonald – Chemical Engineer, and Dr. Tara Taylor – Mathematician, for chatting to the girls about their careers and broadening their knowledge of STEM careers. A special thanks also goes out to the Women in Science group at St. FX who had seven members volunteer with us! Visit our Facebook page, facebook.com/WISEatlantic to view pictures of the event. We were pleased to see an increase in applications for our Partnerships Program for the 2019 year, but it made it much harder to decide! Thank you to all organizations/individuals who applied. Terranaut Club – For their outreach project ‘Technology in Marine Conservation’ which will see 10 underrepresented High School girls from Halifax and Dartmouth attend a summer camp at Dalhousie and Acadia Universities to learn about Technology in Marine Conservation. 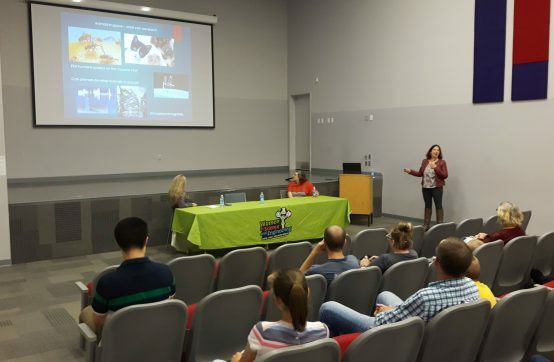 Dr. Svetlana Barkanova at Memorial University Grenfell campus – For her outreach program ‘Open Space: Engaging Teens in Western Newfoundland in Physics and Astronomy’. Partnerships funding will allow female Physics professors at Grenfell to travel to rural schools in NL, including remote First Nations communities, to present and engage with students on current topics in Physics, Astronomy, and Cosmology. 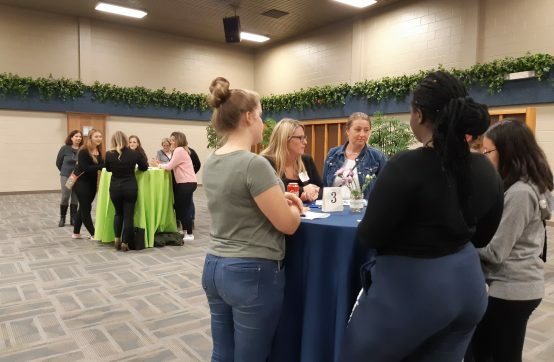 The Atlantic Canada Water and Wastewater Association (in partnership with Acadia University – for their project ‘Analysis and Development of Diversity and Inclusion in the Atlantic Canada Water Industry’. Funding support will assist these partners to develop and conduct a research study focusing on diversity and inclusion issues faced by ACWWA’s membership. Refresh Annapolis Valley– For their ‘Build II: Computer Science Camp for Girls’ which is a week-long summer camp for 20 girls which allows them to explore the world of Computer Science. This camp aims to provide free registration for girls from underrepresented communities. Click here for more info on our Partnerships Program funding. 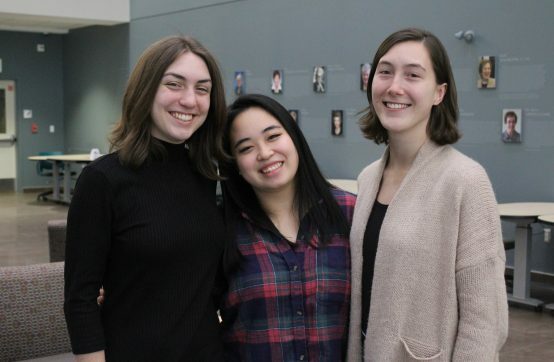 Catching-up with past Girls Get WISE event participants Madyn, Molly, and Emily as they detail the impact WISEatlantic had on their post-secondary pathways. Lottie Pascal, a Grade 11 student at Prince Andrew High School, left at the end of the night with a greater understanding of careers she’d never thought of as an option. The event was an important way for the role models who volunteered their time to meet with the girls to fill a gap they wish had been acknowledged when they were in high school. Lauren Harrie, a role model at the event, graduated from the Mount with a Bachelor of Science and works as a Bone Marrow Transplant Specialist with the Nova Scotia Health Authority. She says that when you’re in high school, it’s hard to know about all the roles available in STEM because there are many that no one talks about. Tanya Cole was another of the role models who volunteered her time to meet with the girls. She works as a Registered Dietitian in long-term care, but didn’t discover her current career path in dietetics until she had already begun studying business at university. She switched to MSVU’s Applied Human Nutrition program after learning it was an option. 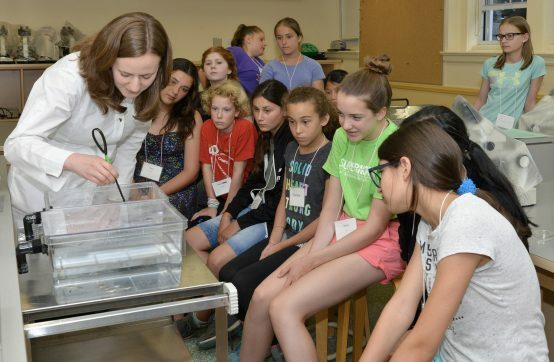 This year marked the STEM Aware event’s second anniversary, and it’s an event that NSERC Chair WISEatlantic, Tamara Franz-Odendaal, hopes will continue to grow and builds on from our already highly successful activities for girls in junior high. 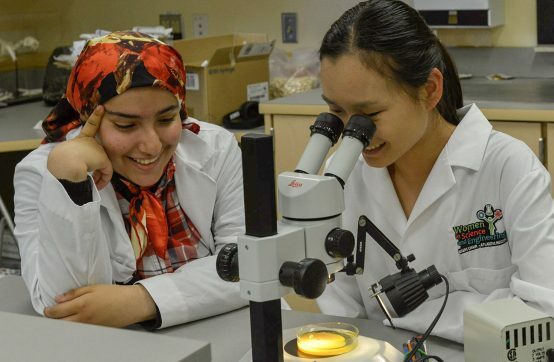 In future years, this event will continue to provide girls like Lottie and Rahaf with new perspectives on what a career in STEM fields could look like, and give them a solid foundation on which to make post-secondary and career decisions. But Lauren Harrie wants anyone still worried about their future to remember that their decisions aren’t always as final as they think. Written by Emily Albert, WISEatlantic Volunteer and Mount student. There is still time to apply for our Partnerships Program for the 2018/19 year. This program is an opportunity for community organizations in Atlantic Canada to apply for small one-year sponsorships for new activities and/or projects that promote the outreach, recruitment, and retention for girls, young women, and industry professionals in science, technology, engineering or math (STEM). If you have a great idea for a new activity, conference, workshops etc. that aims to support girls and women in STEM and you and/or your organization is located in any of the Atlantic Provinces, then be sure to apply. You could receive a sponsorship of up to $3,000! Make sure to visit the Partnerships Program page of our website for deadlines and application guidelines. We were excited to participate in Science Literacy Week again this year with our event Out of This World! Explore Space with Local Scientists. As the theme of Science Literacy week this year was Space, we decided to host an event that showcased the space-related research happening right here in Atlantic Canada! Our event featured Dr. Svetlana Barkanova, a Physicist at Memorial University Grenfell Campus, who spoke about her research into Dark Matter; Astrophysicist Dr. Catherine Lovekin who detailed her research who focuses on the structure and evolution of massive starts; and WISEatlantic Chair, Dr. Tamara Franz-Odendaal, who discussed her research on bone development of Zebrafish in a microgravity environment. The event was hosted at Woodlawn Public Library to a very engaged and curious audience of over 50 people. We would like to thank NSERC, Science Literacy Week, and Halifax Public Libraries for the support of this event. We had a great turn-out for our 2nd annual Senior Girls Get WISE Science Summer Camp this year, 18 girls ages 15 & 16 participated. We had a great week learning about various STEM professions such as Entomology, Psychology, Embryology, Computer Scientist and more! Campers also participated in many engaging STEM activities such as bee classification, viewing chick embryos. doing flame tests in Chemistry, and learning how an EEG works. View photos from the camp by clicking here. We had a blast at our 6th annual Girls Get WISE Science Summer Camp! The girls had a full week of activities including zebrafish development, outdoor scavenger hunt, coding their own Mad Libs, egg drop, and so much more! We want to thank our camp sponsor Lockheed Martin Canada for coming in to do a session on 3D printing! If you’d like to view photos of the camp, click here. 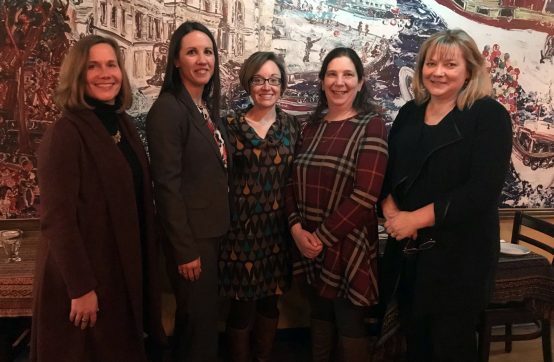 WISEatlantic Chair, Dr. Tamara Franz-Odendaal, was honored to participate in the Diversity in STEM: Why It Matters panel discussion at Acadia University on March 6th, 2018. Other panelists included Ulrike Bahr-Gedalia, CEO of Digital Nova Scotia, Dr. Imogen Coe, Dean of Faculty of Science at Ryerson, and Denise Pothier, Vice President of Practice Services at Stantec. Special thanks to Dr. Randy Newman at Acadia for organizing this event. WISEatlantic was a proud sponsor. 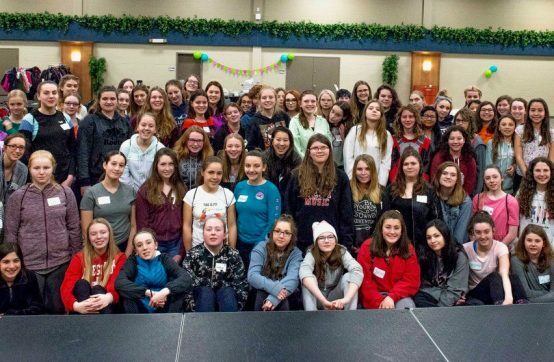 On April 7, 2018 WISEatlantic hosted their largest Girls Get WISE Science Retreat yet with 80 girls participating! This year featured three hands-on activities, Nifty Neuroscience, Electrifying Chemistry, and the Mathematics of Winning. We were also fortunate to have El Jones, the Mount's Nancy's Chair in Women's Studies, join us to perform an inspiring spoken word poem. As always, thank you to our sponsors, partners, volunteers, and role models for making this event a success! The NSERC Chairs for Women in Science and Engineering are pleased to release a new report entitled "Analysis of the Distribution of Gender in STEM Fields in Canada". This report, compiled by Andrea Perreault, takes a focused look at the percentages of women and minority groups in the STEM professions in all regions of Canada. The full report is available on our resource page. The NSERC CWSE National Network National Conference Grant is administered by the NSERC CWSE Chairs. 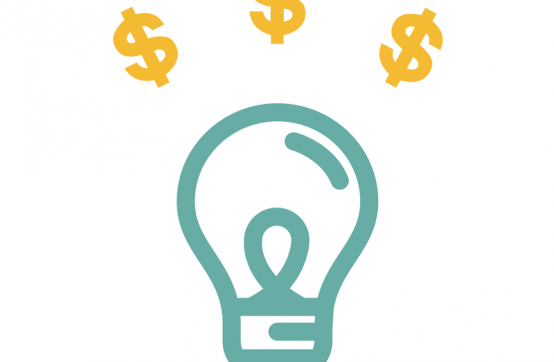 Applications for funding are accepted three times per year. Applications may be submitted by individual students, professors, professionals outside of academia or organizations during the intake periods. All received applications will be reviewed for consideration. The objective of the NSERC CWSE National Network National Conference Grant is to support national conferences that contribute to the advancement of women in Science and Engineering (S&E). Winter intake period begins February 1, 2018 and ends February 15, 2018. To find out more or to download the grant forms, visit our resource page. Congrats to the successful applicants! The next round of submissions will open in September 2018 on our Partnerships Program page. Keep up-to-date on all our activities by signing up to receive the WISEatlantic newsletter, which will be sent to your inbox three times a year.